Ultherapy is a new type of nonsurgical procedure that uses medical ultrasound for cosmetic improvement of the skin. Ultherapy works deep below the surface without harming the outer layer of skin, for firming, tightening and lifting. Keep reading to learn all about our specialized Ultherapy San Diego! Improvements include a sleeker, more defined jaw line and tighter skin on the neck under the chin. Sagging skin on the cheeks can be tightened and lifted, which in turn can improve folds from the nose to mouth, folds from the mouth to jaw, and drooping corners of the mouth. Tightening of skin on the forehead can reduce the sagging skin on the eyelids and promote a more open, refreshed look in general. Overall improvements in skin texture and evenness of color – as well as strengthening and adding more collagen “cushion” – can be additional benefits. This will be determined once you have had a consultation , but generally good clinical results are usually obtained in just one or two treatments. In addition, we like to schedule a follow-up visit to take photographs and track your progress. 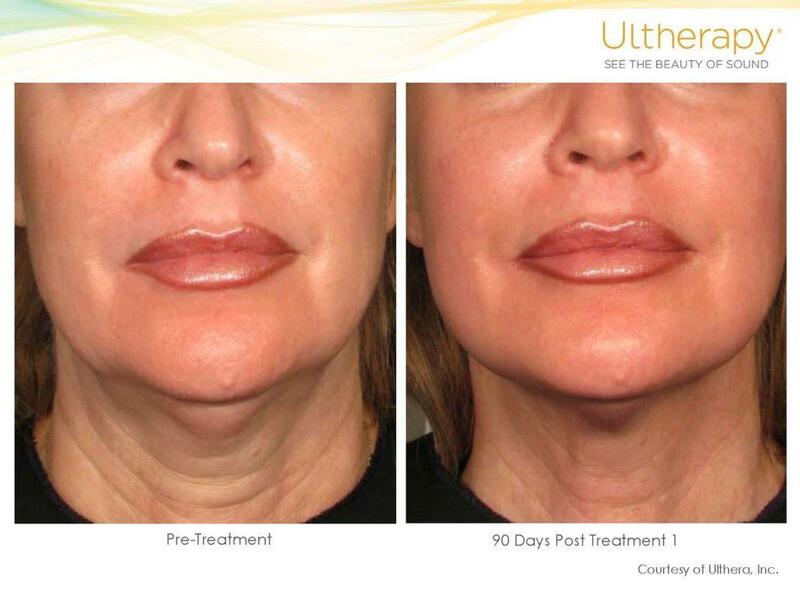 The Ulthera System is designed to treat the entire face and upper neck, or specific regions of interest. We can treat the lower face and neck, or just the forehead and temples, or both. Your practitioner can tailor a treatment plan for you at the time of your Ultherapy San Diego consultation. The regenerative process is initiated right away, but the full effect will build gradually over the course of two to three months or so. In the FDA clinical trial, nine out of ten patients had a noticeable, significant lift of the brow line. This resulted in a more open look to the eyes and a more youthful appearance overall. Patients also reported firmer, tighter, better-fitting skin in other areas of the face and neck as well. A smoother texture and more even skin color are also possible side benefits. Of course, your skin will continue its natural aging process, so you may need to schedule an annual touch-up visit to maintain your results. Is Ultherapy San Diego safe? Our specialized Ultherapy San Diego uses ultrasound energy, which has been used in medical imaging and therapeutics, such as sonograms, for over 50 years, and clinical studies have confirmed the safety of this latest application. As with any medical procedure, there are general safety considerations, which Dr. Mann will review with you. If you’d like to make an appointment for a consultation, we can do an evaluation and give you a specific idea as to the price then. If you choose to go ahead with treatment, we will subtract the charge for the consultation from the treatment fees.